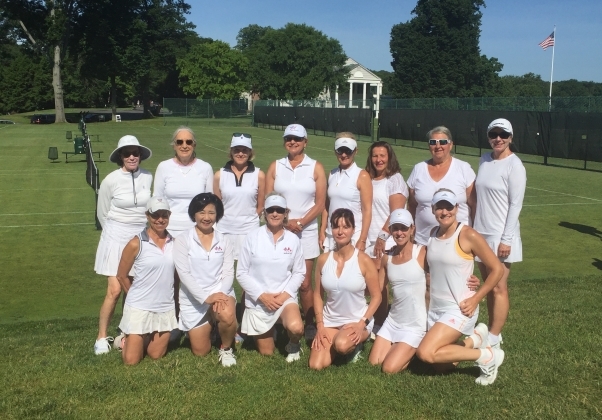 The Gengler Cup event began with a lovely Friday afternoon at the Piping Rock grass courts where the Canadians and USIC team members gathered to meet and greet and play practice sets. We then enjoyed a warm welcome dinner at the charming Glen Cove restaurant, La Bussola, well attended by the Baker Bowl, Sorlein Cup and Gengler Cup players. On Saturday the perfect weather continued and the courts were filled by 9:30am for the first round of matches. IC Canada put out their three doubles teams to take on our first USIC squad of three teams. The result, two to one in favor of IC Canada. With little break for the Canadians, their six players went back on court to take on our fresh USIC team of 3 new doubles teams. With these three matches all going to third set tie breakers, Canada swept 3-0 for a 5-1 lead on the day. After our courtside luncheon, no one wanted to leave. 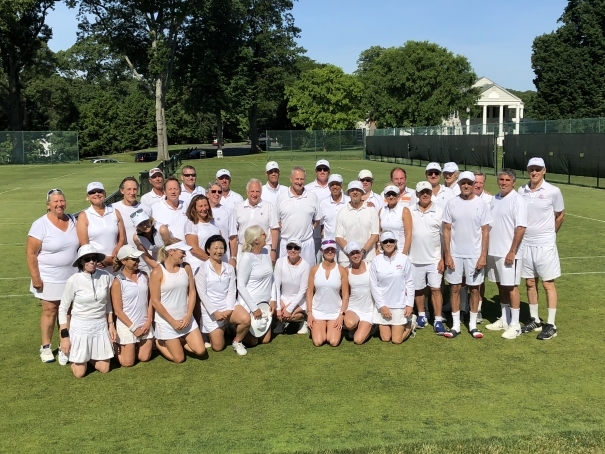 The Baker, Sorlein and Gengler Cup players all went back on the courts for friendly and competitive mixed doubles matches. It was a full Saturday of play. Our Gengler Cup team included some special off-court support with Judy Aydelott attending and sharing her new book, “Sport of a Lifetime”, dedicated to Fred Kovaleski and donating proceeds to the USIC. We were all thrilled to have Margie Cooper join us for some grass court friendly play and the banquet. Jeanne Logan Gengler, would have loved seeing friends and family gather through tennis. Her daughters Nancy Gengler Saint from London and Marion Gengler Melton from NY cheered the team on along with granddaughter Austin Smith and great grandchild Tatum. After a special evening at the Piping Rock Club’s Main Clubhouse for our IC banquet, players were back on the grass courts early Sunday. The women played two morning rounds of 8-game pro sets. This time, it was the USIC that won 5 matches to Canada’s one resulting in a 6-6 tie. The pre-determined tiebreaker using total sets won gave Canada a well-deserved victory and the Gengler Cup traveling trophy to take home. New friends, old friends, great tennis, and a great time was had by all!